It was on. Remember my post on the first game of the Whipple era? Yesterday had that feel to it. Remember the derision in the media when we got stuffed by UConn? Yesterday felt like one of those MAC shootouts. The UMass fans gave the team a round of applause after a loss! The UMass offense has had 51 first downs and 919 yards of offense in the last two games. Rob Blanchflower (5-80) and Deion Walker (11-162-1 TD) had two absolute circus catches. Michael Cox had 80 yards rushing against a team that had been allowing 83 yards/game total. Congrats to the players and staff who fought through the tough BCS opening schedule. The players looked like FBS players. UMass belonged yesterday. We're still missing some pieces, but UMass is going to be a power in the MAC. Coach Molnar and his staff put together a good initial recruiting class and the current one looks to be even better. Remember all they had to sell is a vision and a couple of cardboard posters. Our new football facility starts construction in February 2013. Someone said in a comment that they were glad to be on board as UMass starts on the ground floor. The elevator is going to go up. I can feel it. Game story notes and quotes from the UMass website. The same from the Bobcats website. Matty V. said UMass couldn't complete the upset. Harry Plumber of MassLive asks "How good was it?" The Boston Globe said someone forgot to tell the Minutemen they were big underdogs. The Boston Herald said the Minutemen were sunk by a Blakenship. SB Nation Boston said UMass lost a heartbreaker. The Worcester Telegram said the Minutemen showed they belonged. Mac Report Online said Ohio survives a stiff UMass challenge. All the MAC results here. Oh, and you have the read the write-up on Zac Dysert, Miami of Ohio's QB. The Redhawks had 408 total yards against UMass. Dysert had 624 yards by himself against Akron. Well, the weather looks to be slowly improving and I hope the Minutemen continue their improvement too. UMass fans get to see a top-25 team that beat Penn State. The most often adjective used to describe the Bobcats is "solid". They don't make mistakes and don't have an obvious weakness to exploit. Tyler Tettleton has thrown zero interceptions. Ohio has only two turnovers all year. They lead the MAC in scoring defense and fewest yards rushing. 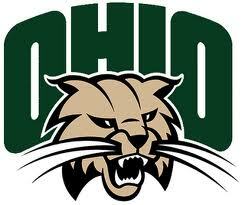 Ohio is the MAC's best and this is where we aspire to be in a couple of years. Given the performance of this year's recruits, I think we will get there. Hope to see everyone at Gillette. Go UMass!!! The game will be carried on ESPN3. Matty V. has UMass welcomes Ohio to Gillette. MassLive.com says unbeaten Ohio is a challenge. Harry Plumer runs the NCAA13 simulation and gets Ohio 44-UMass 17. The Boston Globe says UMass is playing a team that is on the map now. What's going on in the newspaper business? Now the Globe has gone to the "Arctic Snowfield" format too. The UMass Daily Collegian states the Minutemen welcome unbeaten Ohio to Gillette. SB Nation Boston says the Minutemen search for their first win. The Parkersburg News says the Bobcats are set for UMass. The Athens News has Solich sounding off about Osbourne and Tettleton. 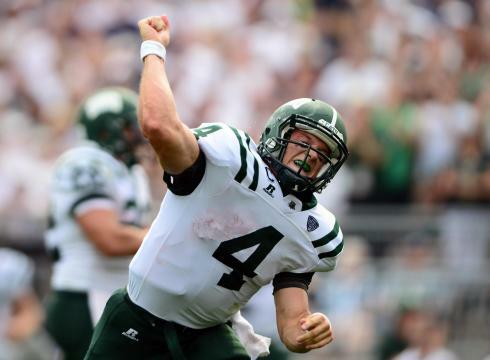 Ohio QB Tyler Tettleton remains "possible" for today. The MAC Daily runs down today's league games. The MAC Blog "Hustle Belt" previews today's games. Cleveland.com says injuries are taking a toll of rosters in the MAC. 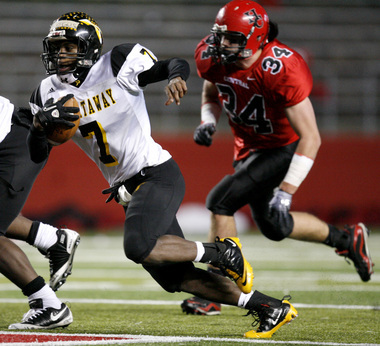 The Jackson Free Dealer says it's the rise of the "mid-major" football conferences. Matty V. has UMass hopes for more success in the Red Zone. MassLive's Harry Plumer continues his series on the campuses of this year's opponents and features Athens, Ohio. He also has a post on a site that will allow you to design your own football uniforms. The MAC Blog "Hustle Belt" has an Ohio-UMass preview. They also have a post on the this week's UConn-Buffalo game. Rhode Island has been down-sizing to 40 scholarship as part of their move to the NEC. That's translated into a tough year for the Rams. Their 0-3 and are losing by an average score of 34-7. Hustle Belt has the Bowling Green-Rhode Island preview. The Worcester Telegram has a story on the other life of UMass football radio announcer Matt Goldstein. The UMass Daily Collegian has an article on undefeated Ohio coming to Gillette. The Boston Glove says Ohio is on the map now. MAC Report online says the banged-up Bobcats meet improving UMass. The Norman Transcript features Ohio's dynamic duo of Beau Blakenship and Tyler Tettleton. Bobcat bios for Blakenship and Tettleton. Tettleton has been stellar in the passing game 66-99 0 INT 66.7% 156.27 EFF AVE 7 TD's 260 yards a game. Blakenship 113-468 4.3 AVE 3 TD's 122 yards/game. The Athens News has a story about Bobcat backup QB Darrius Vick who shined off the bench against Norfolk State. "To all those who came out to Gillette Stadium on September 8th to see the Football team in their home opener against Indiana University, we at UMass would like to sincerely thank you for your support. Though the on field result was not what any of us would have like to have seen, we know that this is a ground up, building process that can’t be done without the support of a great fan base. The team has shown improvements over the course of the season, as evident in their most competitive game of the year, last week against Miami, Ohio. In order to keep this season going in the right direction, we need the same outpouring of support we got from you at the home opener. This Saturday, the Minutemen take on the Ohio University Bobcats at 3:30pm at Gillette Stadium. We received tremendous feedback about the family friendly atmosphere and the full-day experience fans got from attending game one. On Saturday, our Minutefan Park will be open 3 hours prior to game time with inflatables, games, and the stars of the Ringling Bros. and Barnum & Bailey Circus Fully Charged. After the game, there will be an exciting fireworks display. Your support means a lot to us, so we hope you’ll join us in a full day of fun and entertainment. Come on down to Gillette for free parking, tailgating, entertainment, football, and fireworks to support your UMass Minutemen on their journey to the top!" Ohio has an article and game notes for the UMass game up. Matty V. has injuries may affect both teams during the UMass-Ohio game Saturday. CBS Boston has Coach Molnar on what makes Ohio a successful team. Harry Plumer has injury updates for Saturday's game. SB Nation Cleveland thinks the Bobcats will remain unbeaten against the Minutemen. SB Nation Boston looks at the New England games this weekend. Note that Boston College has yet to win a FBS game. The Eagles just had a 2013 decommit. The Indianapolis Star says the MAC takes pride in defeating BCS teams. Sports Illustrated says the MAC likes felling tall timber. The NY Post said a year ago, it was three big plays at Philadelphia that jump started Victor Cruz's career. Burke also holds offers from Boise State, Georgia State, Marshall, Middle Tennessee, San Diego State and Western Michigan. Matty V. has an article on UMass CB Mike Lee and his comeback. BTW, "Meh" on the Gazette's redesign. Lots of white space. Notice the similarity to the redesign of SB Nation blog format. Both changes happened almost the same day. Ohio coach Frank Solich talks about Ohio and the UMass game. Video highlights of the Bobcats 44-10 win over Norfolk State. CBS Sports reports there may be a seventh playoff bowl in the future. The MAC would be one of the conferences eligible for the slot. The MAC Blog "MAC Daily" moves UMass out the cellar in conference ratings. Victor Cruz will be playing back in a career-making place. CBS Sports New York has Victor commenting on the replacement refs. I have been meaning to post this since my first trip of the season to Gillette on September 8th. Mrs Blog and I went to the the two UNH games in past years. Gillette is a great venue to see football, but the traffic was horrendous both times. The problem was both times we ended up in sections #3 or #4 (see attached map). The slow drive to make a left turn at P1 on to Rt 1 and the crawl past the various stadium exits took an hour. However, this year's trip was a revelation. We had season tickets with the VIP Parking passes. Markings: Pink in-- Green out. Directions Arriving: Western Mass fans coming down I 495 (and having VIP passes) should enter Gillette at P8. 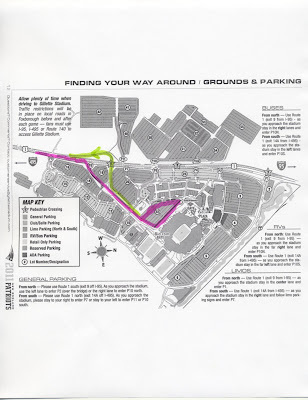 Drive directly at the stadium until you come to four-way intersection. Go straight. 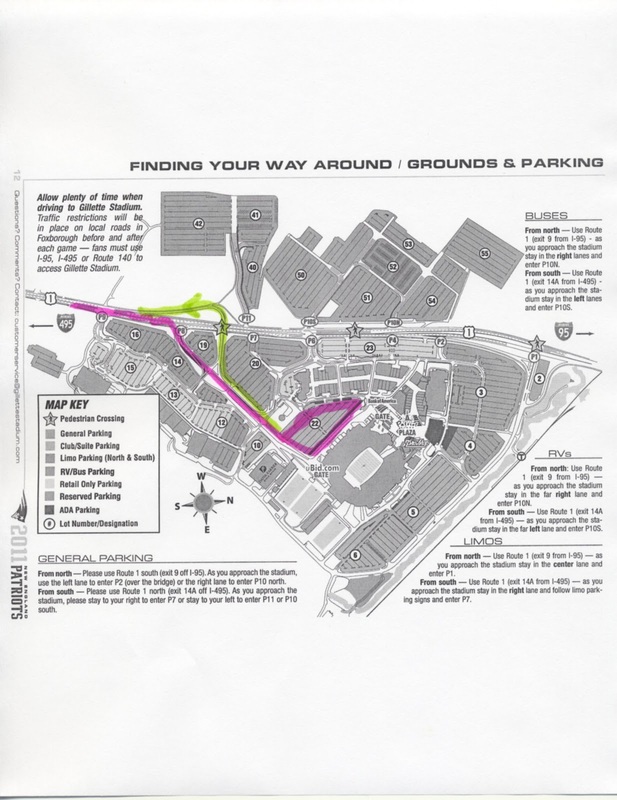 There will be parking attendants with the straight option partially blocked off. Display your VIP pass and they will let you go on to Section #22. That's between the tower and Gillette. Park/tailgate there. Access to the Stadium is by walking left (facing the stadium) and down a flight of steps. Directions Out: This is where the VIP pass really shines. Leave the #22 parking lot and go straight towards P8. At the end of the road take a sharp right onto an overpass exit that merges into RT 1 North (actually going west) towards I 495. That totally shortcuts the left hand turn at P8 and the slow drive past Gillette on RT 1. We were on our way in five minutes. I realize that when the crowds get larger, this will slow down some, but it's still light years better than the other way. So IMHO, western MASS UMass fans should take advantage of the Season Ticket Package with the VIP Parking, if at all possible. it will make your commute to Gillette much more enjoyable. If you didn't get the package this year, do yourself a favor and get it next season. UPDATE-- EXCEPTION: I should have mentioned that there is no Club Seats entrance from the Lot 22 side of the stadium. If you should be mobility impaired AND you have Club seats then VIP Lot # 5 would probably be better. It's a fairly long hike around the stadium with lots stairs from VIP Lot #22. The UMass Athletic Dept website has Michael Cox named to the College Football Performance Awards running back award for his performance Saturday. The UMass site also has quotes from Coach Molnar on the MAC weekly teleconference. Matty V, coming from an apparently reworked Gazette site, has a story about Ohio' QB Tyler Tettelton possibly not being available for the UMass game. Matty reports Michel Boland and Marken Michel have returned to practice. SR D.J. Adeoba's UMass is career is over with a knee injury. Harry Plumer of MassLive has three UMass stories: UMass football notebook, UMass high five--the last five perfect MAC teams and Bobcats QB Tyler Tettelton a question mark against the Minutemen Saturday. Fox Sports Ohio has the Bobcats creeping toward a top-25 ranking. Miami (Ohio)'s Zac Dysert was the MAC East offensive player-of-the-week for his performance against UMass. Perhaps the most shocking of the MAC's wins last Saturday was Central Michigan over Iowa. Brandon London made a big comeback against the Argos. Harry Plumer of MassLive has three helmet stickers for the Miami (Ohio) game: Michael Cox, Kassan Messiah and Deion Walker. The Boston Herald reports UMass is desperate for a win. This pre-Miami (Ohio) story from the Herald features Norte Dame transfer Hafis Williams. The Daily Collegian says despite the loss, UMass looked like it belonged. The MAC Report online has a good recap of the game. CBS Sports says it was a Saturday to remember for the MAC Conference. The MAC blog "Hustle Belt" asks if Saturday was the best ever day for the conference. Cleveland.com reports that UMass' next opponent Ohio, is one of the 27 undefeated FBS teams in the nation. Some random thoughts about the Miami (Ohio) game. 1. Hey, we didn't win the damm game, but we were highly competitive in our first ever league game. We definitively need some more recruiting success, but we're going to give the league a hard time in a couple of years. 2. Kessan Messiah needs to start. 3. Michael Cox was the best RB on the field. He went 30-190 Loss 2 188 Yards 2 TD 24 Long 6.3 yards/carry. He did a spin move on one carry that looked like Marcel Shipp. 4. 471 total yards and 26 first downs. That's progress. We made a bunch of mistakes, but that can be corrected. Cox's back flip TD made USA Today. Matty V. says despite improvement, UMass is still winless. Matty also has Kessan Messiah made an impact. Unfortunately, D.J. Adeoba may be gone for the year. 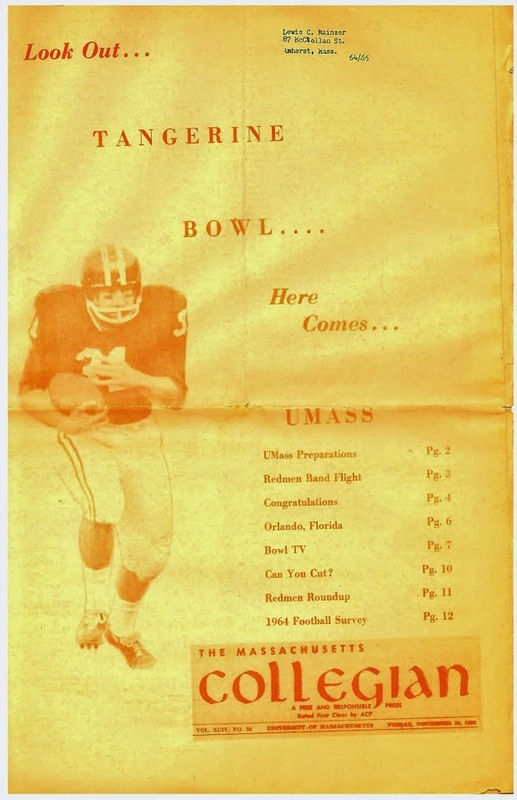 The Boston Globe said UMass stumbled in its first MAC game. MassLive states Michael cox gouged the Redhawks defense for 188 yards. Plumer said missed opportunities cost the Minutemen. Harry said the Minutemen's inexperience showed. The Boston Herald said UMass missed out. The Redhawks site says Miami pulled away. Cincinnati.com said Dysert lead the Redhawks past UMass. The MAC conference had a good day Saturday with wins over Iowa, South Florida and UConn. Where we were. New Hampshire lost to Old Dominion 64-61. All right. Today we start MAC games. Up until this time, we have been a mostly FCS team playing a BCS schedule. Moving to league play means the talent level won't be as overwhelming. However, the MAC is still several steps ahead of where we are right now. Kent State beat Towson (picked by many to compete for the CAA title) 41-21. Miami (Ohio) should be a couple of TD favorite, but let's get the running game working and cut down on the penalties. I would like to see some positive stuff happen to reward the players and coaches who have worked hard this year. Matty V. says Miami and UMass have many similarities in their athletic programs. The UMass Daily Collegian says the Mimutemen start league play today. The Boston Herald states UMass kicks off league slate. MassLive says league play will be the real measure of UMass. Harry Plumer runs the NCAA13 simulation and gets Miami (Ohio) 27-UMass 10. The MAC blog "Hustle Belt" does a question-and-answer on Miami (Ohio) -UMass game. 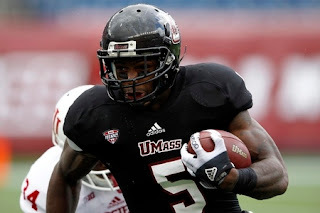 MAC Report Online also does a comprehensive game preview of the UMass-Miami (Ohio). SB Nation Boston has Mike Wegzyn and the Minutemen take on the Redhawks. Cincinnati.com reports Zac Dysert looks to have a big day against the Minutemen defense. The stories above report that the Redhawks star receiver Nick Harwell, will be out of today's game. 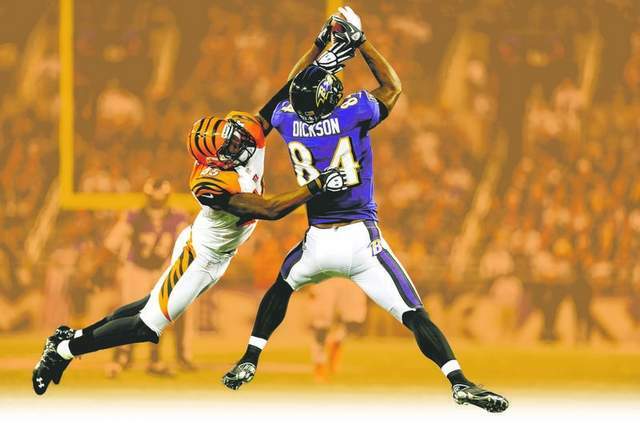 Harwell had 97 catches in 2011 for 1,400+ yards. Interesting game today as UConn meets Western Michigan. Brandon London, coming off a knee injury, returns for the Argos game. Boston.com says UMass prepares for Miami of Ohio. Harry Plumer reports Christian Birt and Alan Williams will be game captains for the Redhawks Saturday. Plumer has some quick facts about Miami (Ohio) and there's no "of". Matty V. says the Minutemen ready to turn the page to conference play. The Maimi Student says the Minutemen storm Miami for homecoming. This article features Redhawks kicker Kaleb Patterson. Miami (Ohio) is, of course, "The cradle of Coaches". Speaking of kicking, it's been a problem for the whole MAC conference. The MAC Blog "Hustle Belt" has two-deep changes for the entire league including UMass and Miami (Ohio). FCS school UNI is exploring a move to FBS. Note that the article references the four team BCS playoffs starting in 2014 that could provide mid-major FBS teams like UMass with $1 million annually in revenue sharing. I would think that fan pressure will eventually move the playoffs to a FCS-style 16 teams, which has the potential for even greater amounts of TV money. 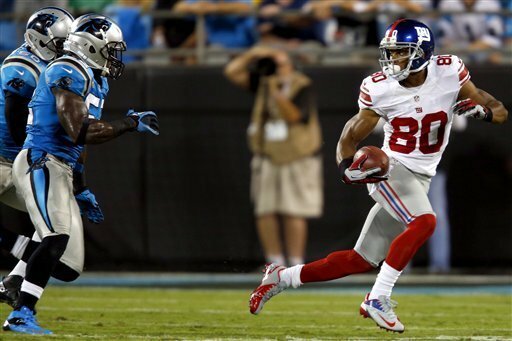 Victor Cruz had 6 catches for 42 yards last night as the Giants crushed the Panthers. 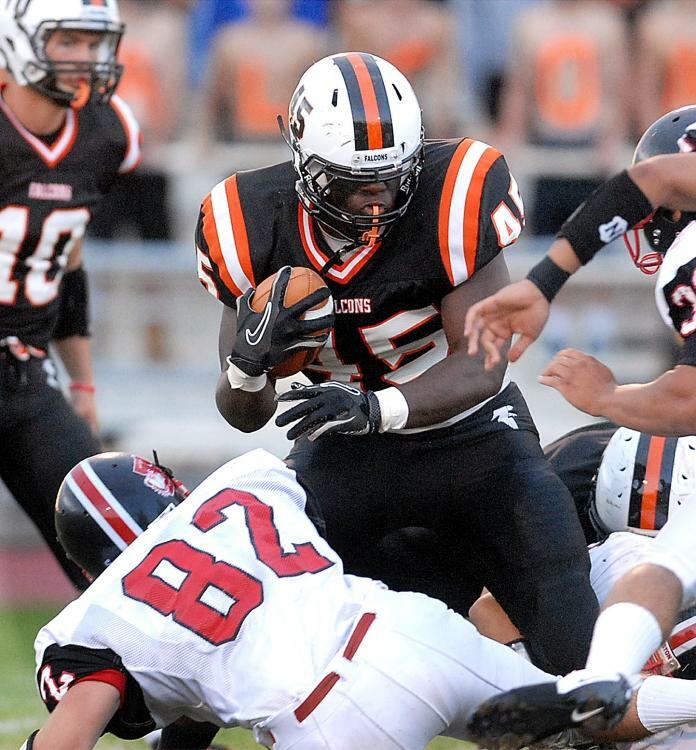 Nadir Barnwell a 5-10 180 pound athlete has verbaled to Rutgers. ESPN recruiting has the story here. NJ.com has another story on his verbal here. I've blogged about Barnwell before. Barnwell was the highest rated (four stars) recruit on the UMass recruiting list. He was a teammate of Tajae Sharpe. Week IV of Bloggers vs Media contest is up. Matty V. had the only correct prediction on the MAC game last night. Losing MAC All-Conference RB Brandon Oliver didn't help the Bulls. UMass has a different challenge this week stopping Miami of Ohio's Zac Dysert. Matty V. has the story here. UMass football has their game notes for the Miami of Ohio game up. Springfield and Boston TV stations will air Saturday's game between UMass and the Redhawks. UMass kicker Brandon Levengood has regained the starting spot on the special teams. Western Michigan meets UConn this week. Cincinnati News says Jeromy Miles has seized the importunity. 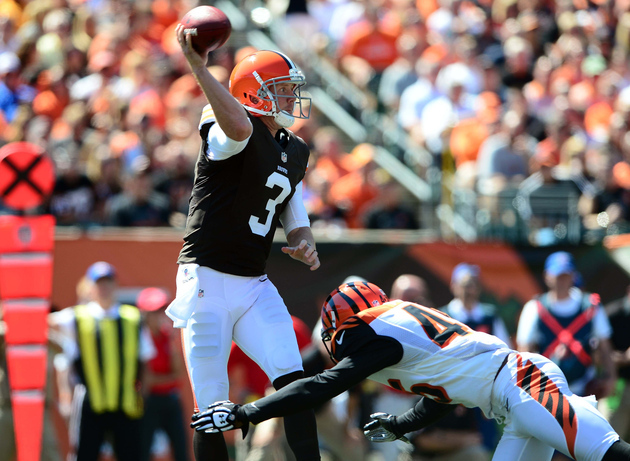 Marvin Lewis says good things about Miles during a press conference. A number of sites report that Daquan Mack, a 6-1 245 pound FB from Fairless Hills, PA has verbaled to UMass. College football Outpost has a mention of Mack's verbal. Mack's 2011 highlight video above. Harry Plumer of MassLive takes a look at the UMass running game. Plumer also has three helmet stickers from the Michigan game. CBS Boston has a story about UMass moving into the league portion of the schedule. The Miami Redhawks hope for a fresh start against UMass. The Miami Student recaps the RedHawks loss to Boise State. Kent State, which was expected to have the MAC's best defense gave up 539 yards against Kansas State. Meanwhile, Buffalo's offense has been very good so far. CBS Sports says the replacement refs have been allowing a lot of grabbing on WR's like Victor Cruz. Brandon London should return to the Larks offense this Saturday. Matty V. has three stars from Michigan. Matty also has an article on Quinton Sales leading the young UMass line. It has a lot of player news. Sr OL Malcom Speller and RSFR Brandon Howard are no longer with the program. WR Marken Michel (arm), DT Galen Clemons (head injury), OL Michael Boland (concussion) and Stephane Milhim (sprained knee) are injured. Milhim may play Saturday, the others are out. Dalvin Battle is confirmed out for the season. Matty also has a college football notes article. 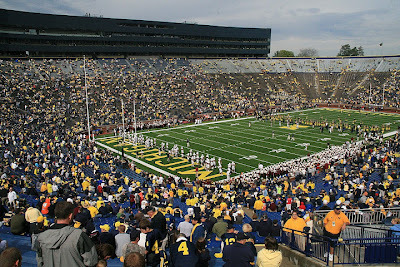 "Hold-the-rope" reviews the Michigan-UMass game over on the Maize-and-Blue Blog. Michigan recruiting prospects enjoyed the game. Sports Chat Place has a preview of the UMass-Miami of Ohio game and has the Redhawks a 24 point favorite. 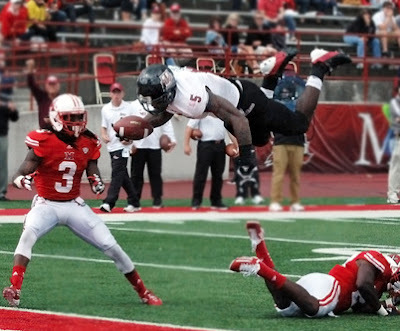 The Redhawks, you will remember, lost to Boise State on the road last Saturday. Miami of Ohio does not seem to have a football blog. The week #4 MAC TV games. This week's MAC power ratings. The NY Times breaks down Victor Cruz's 80-yard TD play. Matty V. says Michigan ended the first chapter of the Minutemen's first season in FBS. The Boston Herald says Coach Molnar accentuates the positives. The UMass Daily Collegian states the Minutemen are making baby steps. BTW, Boston College had just 25 total yards rushing against Northwestern. Plus the Eagles gave up 560 yards of offense. Don Brown's defense held Maryland to 205 total yards in the Huskies win over the Terps. ESPN has a nice story on Victor Cruz' tribute to his grandmother. The NY Post said Victor did a touchdown salsa. Jeromy Miles brings the pressure against Browns' QB Brandon Weedon. Miles had 16 TT in 2011. He has 10 in two games in 2012. I'm having Wi-Fi connection problems out here in NY. If this keeps up, production will be sparse until I get home tomorrow evening. Gone from the 2010 team that gave Michigan a hard time are All-CAA players Anthony Nelson, Greg Niland, Tyler Holmes, Jonathan Hernandez, Julian Talley and John Griffin. We need more team speed at defense. Last time, we were at least able to slow down Denard Robinson. Penalties have hurt UMass scoring chances the last two games, but with the number of freshmen we are playing, it may continue. The offense seemed to continue to improve. The Michigan defense we played was not the same caliber as the one that got Rich Rodriguez fired after the 2010 season. Hafis Williams had five solo tackles. The whole DL only had eight. Matty V. says this time, UMass was no match for Michigan. He reports on Michael Cox's 4.2 yards/carry. In fact, all UMass running backs averaged over 3.5 yards a carry. We again had injury problems as UMass ended up with two starters out of the offensive line. Dalvin Battle may be gone for the season with a knee injury. Robert Kitchings was the 25th freshman to play in this season. MassLive says UMass got steamrollered. Boston.com says UMass was overwhelmed. ESPN says Robinson had a real big day. MAC conference scores and game summaries. Ball State beat Indiana on a last second field goal. Eastern Michigan, and established MAC team lost to Purdue by a score only slightly less than the UMass-Michigan game. A top BCS team like Michigan would be a tough draw for any transition team at any time, but given where we are right now, it's even rougher. However, three years from now let's say "Remember how we battled and never quit against the Wolverines." Let's take what we can from the game and keep moving forward! Matty V. has UMass takes on the Big House. 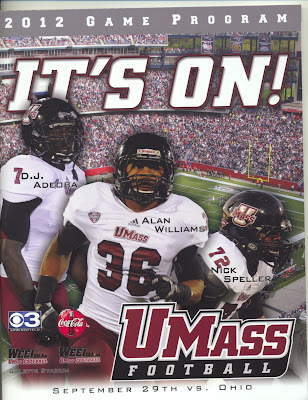 Sports Illustrated has UMass running back to play in stadium he graduated from. The Boston Globe has Michigan by six touchdowns. PreGame.com has UMass Minutemen at #17 Michigan. The Boston Herald has back in the big house. MassLive has trying to stop Denard Robinson. The Detroit Free Press takes a look at the Minutemen. The MAC conference has Game Day Central for the nine league teams in action today. Eli Manning has plenty of faith in Victor Cruz. NBC New York says the Giants players need action not talk against the Bucs. Matty V. reports Michigan QB Denard Robinson is the focus of UMass' defense. I went 12-1 in the second round of Media vs Bloggers tourney. The UMass Athletics site has its game notes for Michigan up. Boston.com says UMass braces for a game at the Big House. The Toledo Blade reports UMass eyes Michigan as the model program. The UMass Daily Collegian says the Minutemen are heavy underdogs. The Collegian says Denard Robinson will will be a big challenge. BTW, Robinson's Michigan bio is here. The Daily Tribune says the transition continues. Michigan's Brady Hoke comments on the 45-point spread. MassLive's Harry Plumer talks money and future scheduling with UMass AD John McCutcheon. Some members of the UMass band will hold a vigil at the Old Chapel for George Parks during the game. The Star Tribune says MAC teams have a chip on their shoulder when it comes to the Big Ten. The Trentonian says it's been a rough week for Victor Cruz. Drew Comeau's UMass Football against ALS group has some tickets available for the remaining UMass home games. Any reasonable donation will get tickets near the 50-yard line and a VIP pass. Contact Drew through the group's facebook page or contact me and I'll pass your request on. Matty V. has some words about Mike Wegzyn's sort-of homecoming, roster moves and some possible news about UMass' 2015 game with Nortre Dame. Getting Anthony Dima back is good news for the offense. 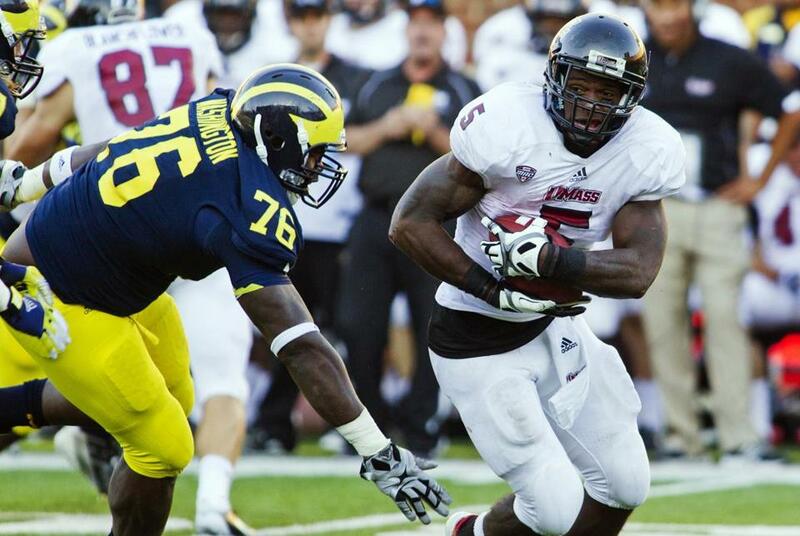 The GBMWolverine Blog has a UMass-Michigan preview. Note that they say that it would outrageous for UMass' transition to FBS to be accomplished overnight. 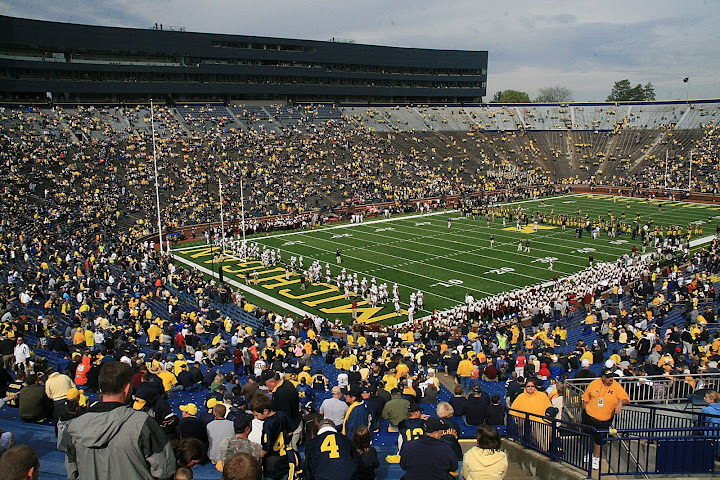 The Michigan blog "Maize and Brew" also has a UMass-Wolverine preview. It's fair to UMass and a good look at Michigan's prospects. Wolverine Nation features UMass running back Michael Cox. Michigan's MLive says UMass' young lineup will get demolished Saturday, but UMass will stick with it's plan. The Buckeye Extra says Michigan still stinks. That reminds me of the best line from UMass' visit in 2010. Mrs Blog and I were walking out of Michigan's stadium after UMass gave the Wolverines a hard time. Several Michigan fans noticed our UMass gear and called out "If this was Ohio State. they'd be burning your car!" Travis Tripucka tried out for the Raiders, but did not get selected. Victor Cruz lost his grandmother Mother Monday. She was the one who taught him to salsa. I've swapped questions-and-answers with the excellent Michigan Blog "Maize and Brew". We also did this back in 2010. Michigan's loss to Alabama effectively knocked the wolverines out of National Championship contention. In 1998, UMass won our National Championship after we had lost 3 regular season games and were ranked #11. What do you think about playoffs for FBS? Would the Michigan administration support it? Michigan fans? 1. I hadn't thought too much about the "being knocked from BCS contention" angle until you brought it up -- I guess that's what happens when you consistently find ways to lower your expectations for the season. It is funny how that works. I would like to think that if Michigan won out it would have a good argument for going to the BCS championship as long as there weren't two major undefeated conference teams, but judging by the performances around the Big Ten thus far, that could be a hard argument to make. As for the playoff I think that Michigan and the Big Ten are as supportive as we are going to get, but at this point that should be enough. The big question is -- as always -- money. Now that the conferences and school presidents have some idea of the money that they can make from a playoff in college football, things are changing. I'm not sure a four-team playoff is the answer, but if it is the first step (I think it is) then things should work out in the long run. The Big Ten has a dominate record against the MAC. How do you view the relative strength of the two leagues? 2. The Big Ten has had quite a bit of success against the MAC, and I don't foresee that changing for the same reason that college football is about to have a playoff: money. The Big Ten is a lucrative television product capable of filling some of the largest stadiums in the country, and with all the marketing, ticket revenue, and now BTN revenue that won't change for some time. With that kind of money comes better facilities, better coaches (on average), better day to day infrastructure for student athletes (academic, athletic, and rehabilitative), and ultimately better recruits. The level of athletes at Michigan or Ohio State is just always going to be better than that of Eastern Michigan or Miami (OH). Even schools like Indiana, Minnesota, and Purdue can consistently rake in better players than the MAC. Such is life in major college football where the rich have inherent advantages not only from the money they make now, but the fact that they've been rich for so long. If Michigan gets a big lead in Saturday's contest, how much do you think Michigan will play their first team? 3. It will depend on how quickly Michigan gains the lead, but history says that Michigan will probably look to bench its primary guys early. Once Michigan is up by three or four scores I imagine Robinson and Toussaint will hit the bench, and I have to believe that Michigan will substitute more liberally along the offensive line in an effort to keep seniors healthy and get freshmen experience -- that's nearly all there is: seniors and freshmen, it's scary thin. My fear is that UMass makes a few plays to keep it within a couple scores at halftime and Michigan has to lean on its starters more, but that's the nature of the game: injuries are always a risk. Hopefully both teams make it out healthy. Do you think Michigan and Umass will play again? 4. I can see Michigan playing UMass again -- hell, Michigan is playing App State again, so anything possible. Michigan routinely schedules MAC teams, and with things beginning to shift away from scheduling FCS teams and toward more "real games" I think MAC teams are an interesting substitute for the bodybag games that most BCS teams have been living off of for the past decade. However, this probably hurts UMass to an extent. I can see Michigan wanting to schedule more of the local MAC programs on the thinking that tickets will be easier to sell with a built in fan base. UMass can't bring that and therefore might not be as attractive an option as Central Michigan or Toledo. How do you think Saturday's game will go? 5. I hope Saturday's game goes like it should. By that I mean, Michigan gets a good deal of push with both lines, Robinson puts up a couple touchdowns early and by halftime Michigan is up by enough scores that you need two hands to count them. I don't think things are quite that smooth though. Michigan's defense will probably struggle a little early, and the offense still has yet to do anything with a true running back this season. I think the first half looks a little ugly but opens up in the second as Michigan gets comfortable. I would expect a five TD win in the end with UMass putting up 10 or 14 points. 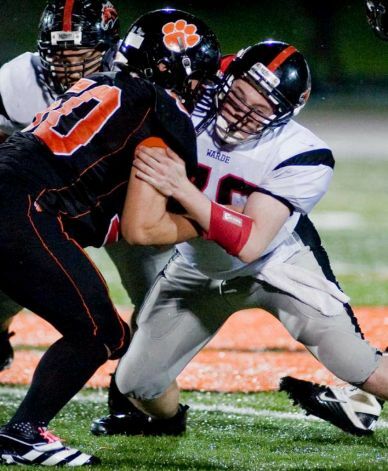 The Middletown Press reports that UMass is interested in Andrew Barton, a 6-3 230 pound LB from Ridgefield, CT. The UMass website has a transcript of Coach Molnar's MAC teleconference. Matty V has Elija Barrows will be Denard Robinson for this week. In injury news (from Matty's article) Anthony Dima will be definitely back. True freshman Dalvin Battle may start for Marken Michel if he's unavailable Saturday. MassLive's Ron Chimilis, a charter member of the half-empty guys, looks at UMass' transition to FBS after two games. GoBlue.com interviews UMass' John McCutcheon. Michigan is looking to stiffen its defense after two lack luster efforts. The Michigan game will be a homecoming of sorts for Michael Cox. Victor is set to return to Cruz control. Question and Answer with "Crimson Quarry"